One Mom's Moxie: Cinderella Enchanted Carriage Vanity Giveaway!!! Welcome to the Cinderella Enchanted Carriage Vanity Giveaway! Do you plan to surprise your little one this Christmas with a cool new toy? Check out the Kmart Fab 15 Toy List to find out what's hot on the market this holiday season! Plus, rank the toys on the list and enter the sweepstakes to win your favorite one! One toy is being given away each day until November 22. Be sure to visit daily for a new chance to win! 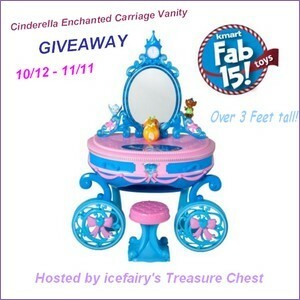 Better yet, you could win this gorgeous Cinderella Enchanted Carriage Vanity right here! As one of the top rated toys on the Fab 15 list, it has a retail value of $99.99! Disclosure: I received no compensation for this publication. One Mom's Moxie is not responsible for sponsor prize delivery. Please contact the host directly if you have any questions or concerns about this giveaway. Be sure to read terms and conditions at the bottom of the Rafflecopter widget.